The Kia Niro was unveiled at the 2016 Chicago Auto Show and appeared on the scene this year as a 2017 production model. The Kia Niro debuted as an all-new, compact, near midsize, urban crossover hybrid that serves up a bold, athletic crossover design, combined with functionality and versatility as well as outstanding fuel economy. 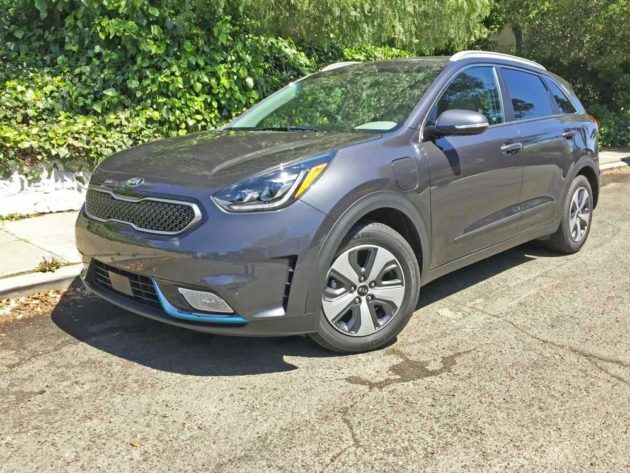 The new 2018 Kia Niro caries over into the new model year with only minor enhancements in trim level packaging. There are five progressive trim models: : the base FE, LX, EX, and Touring. There?s also a Plug-in Hybrid Electric Vehicle (PHEV) model. The entry level FE starts at $23,340., while the top-of-the-line Touring, which now adds standard HID headlights, a wireless phone charger and a suite of Advanced Driver Assistance Features to its impressive inventory of luxury, infotainment and convenience features with a starting price of $32,000. Add a $940 Destination charges for all models. 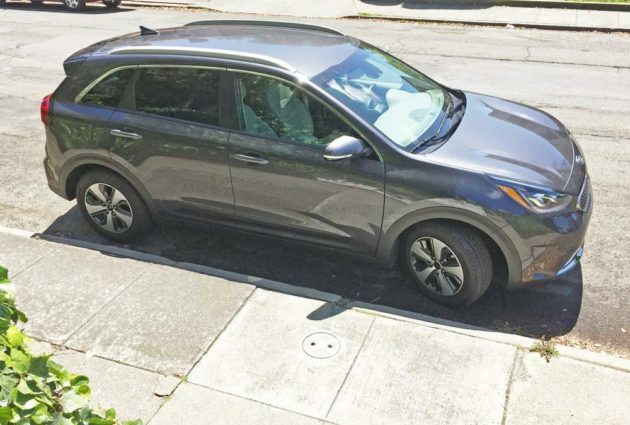 A new limited-production PHEV model for 2018 is the Niro Graphite Edition, featuring an exclusive Platinum Graphite exterior paint color, 18-inch gloss black wheels and roof rails, a metallic grille insert, a Harman Kardon premium audio with subwoofer, an 8-inch touchscreen navigation and a 10-way power driver?s seat. The Niro FE is equipped with a lengthy list of standard features, including: 16-inch wheels; 6-way front seats; power windows; keyless entry; cruise control; 7-inch touchscreen display with rearview camera; UVO3 with Apple CarPlayTM3, Android AutoTM4 and a six-speaker audio system with steering-wheel-mounted controls. Stepping up to the LX trim adds Smart Key with push button start, roof rails and LED rear combination lamps. Among the extras added to EX models are heated combination cloth and leather seating, a leather-wrapped steering wheel, LED daytime running lights, heated power folding mirrors, front fog lamps, and Blind Spot Detection with Rear Cross Traffic Alert and Lane Change Assist driver assistance features. The Touring trim is equipped with an amazing array of additional features ? power tilt/slide sunroof, front and rear park assist, heated and ventilated seats, heated steering wheel, 10-way power driver?s seat with memory and 8-speaker Harman Kardon? premium audio. There are three available option packages: an Advanced Technology Package is offered on the LX and includes Smart Cruise Control, Forward Collision Warning, Autonomous Emergency Braking, and Lane Departure Warning System. A Sunroof and Advanced Technology Package is offered on EX and includes: a power tilt/slide sunroof, Smart Cruise Control, Forward Collision Warning, Autonomous Emergency Braking, and Lane Departure Warning System. The Advanced Technology Package offered on Touring models includes HID headlights, wireless phone charger and 110V inverter, Smart Cruise Control, Forward Collision Warning, Autonomous Emergency Braking, and Lane Departure Warning System. The motive force for all Kia Niro models is provided by a 1.6-liter DOHC, 16- valve four-cylinder Atkinson cycle Gasoline Direct Injection engine that delivers 104 horsepower at 5,700 rpm along with 109 pound feet of torque. The gas engine joins forces with an Electric Motor ? a 240 Volt AC Synchronous Permanent Magnet Motor, 240V / 43 Horsepower /125 pound feet of torque from a compact and lightweight 1.56-kWh Lithium Ion Polymer battery located beneath the rear seat. And because the high-voltage battery is both power and energy dense, it is smaller and lighter than other hybrid batteries, allowing the engineers to downsize the gasoline engine to further maximize fuel economy and reduce emissions. The power produced by the combined hybrid system is 139 horsepower and 195 pound feet of torque. Energy is geared to the front driving wheels, not by a CTV transmission, but rather via a conventional second generation, six-speed Dual Clutch Transmission with standard Sport Mode and dry, multi-plate hydraulically actuated. Visually, the 2018 Kia Niro is unmistakably recognizable as a member of the Kia family, with styling cues borrowed from the larger Kia Sedona and smaller Kia Soul. In many ways, it loosely resembles a reduced version of the Sedona?s overall form, but with its own contemporary personality. And, despite its more diminutive size, the Niro provides a comfortable and spacious cabin for five occupants and their gear, while delivering a full array of driver assistance features including: an advanced high-strength steel structure, seven airbags, available Autonomous Emergency Braking, Blind Spot Detection, Rear Cross Traffic Alert, Lane Change Assist, and Lane Departure Warning. The Kia Niro displays wide and low proportions with a long wheelbase and short overhangs yield in an athletic stance, while aggressively shaped headlights and a new execution of Kia?s tiger nose grille, defining the front theme. The Niro?s profile showcases strong shoulders, defined wheel arches, rocker-panel cladding, and roof rails. The sporty rear image is enabled by its wide stance, rear skid plate, and multi-element horizontal LED tail lamp graphic. 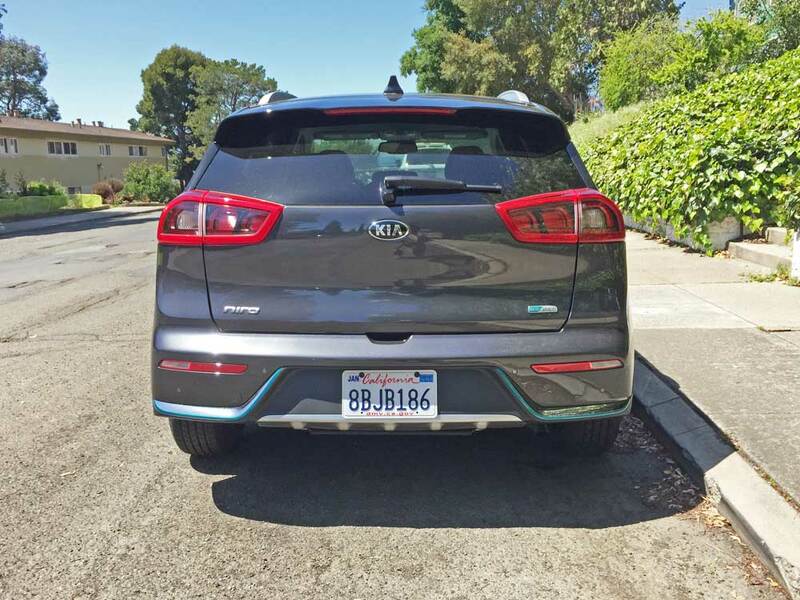 In essence, the Kia Niro doesn?t mimic other hybrids in the marketplace ? it features its own appealing design, delivering an appearance that is strong and athletic, as well as sculpted and modern. Moving to the interior, the instrument panel is uncluttered and clean, with colorful and informative gauges at the forefront and perfectly positioned primary and secondary controls falling readily to hand. The utilization of traditionally simple, ?old school? round knobs is a delight. 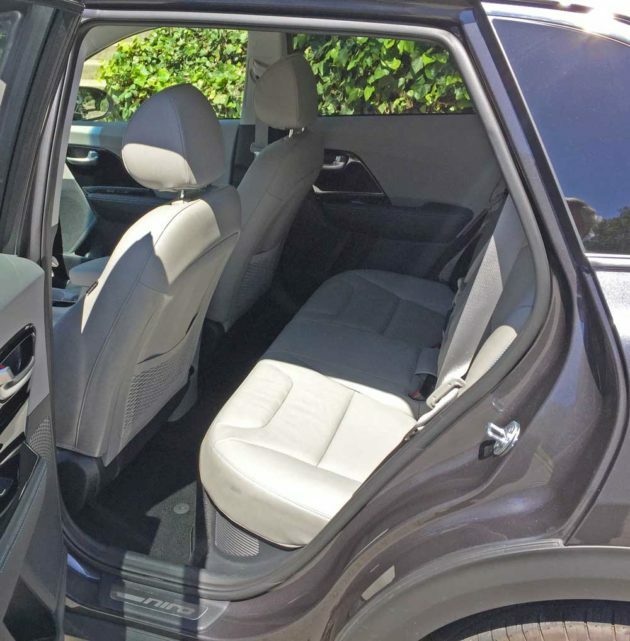 The cabin?s roominess is the result of Niro?s ample106.3-inch wheelbase, body height, and wide stance, which allows for ample leg-, head- and shoulder-room. The packaging of the high-voltage battery assists in delivering a desirable driving experience; its location underneath the rear seats also increases cabin and cargo space and provides a flat load floor. In addition to its spaciousness and comfort, ensuring a quiet interior environment was a key development focus for engineers. Noise and vibration countermeasures were employed to minimize sound invasion. 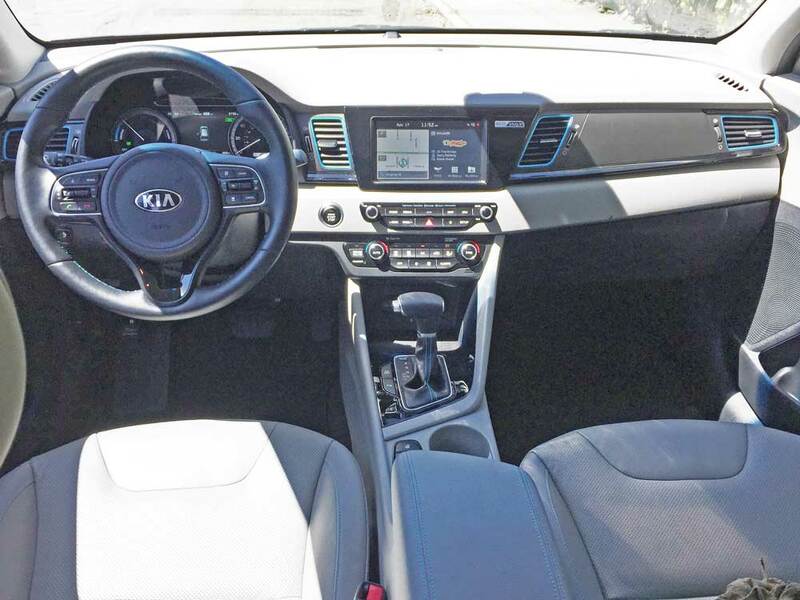 Connectivity is accessible through Kia?s standard UVO3 with Apple CarPlay TM3, Android Auto TM4 and a 7-inch touchscreen and available Smart Cruise Control, navigation and a Harman Kardon? premium audio system. A wireless charge mat for personal devices is standard fare. 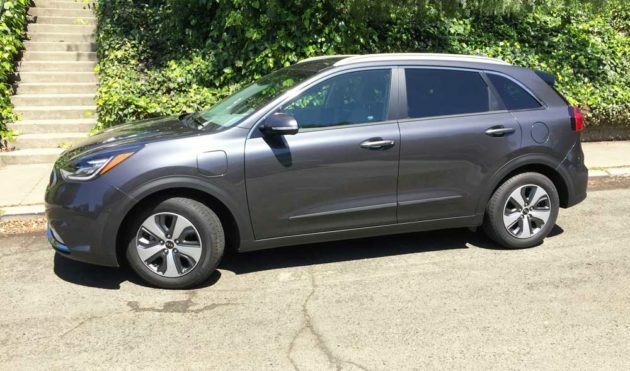 My recent test 2018 Kia Niro was a PHEV model in EX Premium trim. The base price was set at $34,500 with the final sticker totaling $35,575 after factoring in the Carpeted Floor mats and Inland Freight and Handling charges. The exterior was sprayed Platinum Graphite metallic with neon blue hybrid accents. 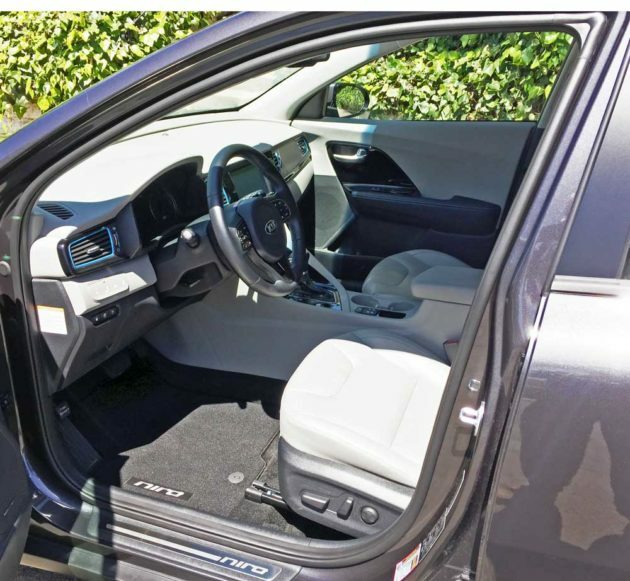 The interior was done primarily in Light Gray with blue accent stitching and Charcoal trim elements. SUMMARY: The 2018 Kia Niro serves up a very un-hybrid-like driving experience. The system is not obvious or intrusive. It accelerates quickly off the line and continues with a smooth delivery of power. Handling characteristics are sporty with a spot-on steering feedback and instantaneous response. Brake feel is also positive thanks to Niro?s regenerative system seamlessly blending in with the hydraulic friction braking system, providing a more consistent and linear feel than most other hybrids. Special attention is also paid to brake feel. 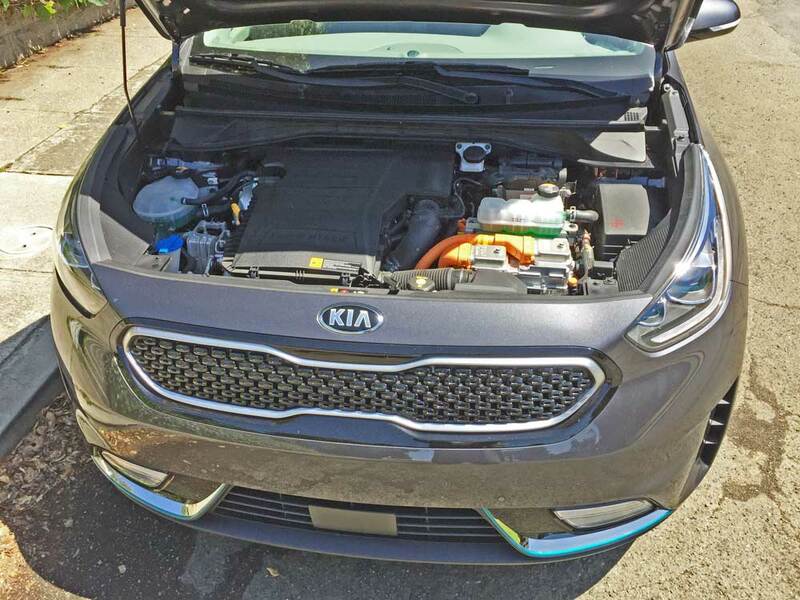 Applying lessons learned through development of two generations of Optima Hybrids as well as the fully electric Soul EV, Kia engineers designed the Niro?s regenerative system to seamlessly blend in hydraulic friction braking. Consequently, deceleration feels more consistent and linear feel than in most other hybrids. An Eco-Driver Assistance System features Kia?s first application of Coasting Guide and Predictive Energy Control, which use the navigation system and analysis of the driver?s route to improve driving efficiency. The Coasting Guide aims at maximizing fuel economy by coaching the driver on when to coast and brake. Predictive Energy Control anticipates topographical changes on the road ahead to actively manage energy flow, determining when it?s best to recharge the battery and when it?s best to expend stored energy to optimize overall efficiency. The Niro is the latest vehicle introduced under the Kia Motors EcoDynamics environmentally friendly sub-brand and represents a number of firsts. While it was preceded by clean mobility products such as the Optima Hybrid and Soul EV, Niro is the first Kia to make use of an all-new, dedicated eco-car platform and is an important next step on the path to nearly tripling the brand?s global EcoDynamics line-up by 2020. EPA mileage estimates for the Kia Niro Touring are: 51 mpg city, and 46 mpg Highway with a range of 583 miles. 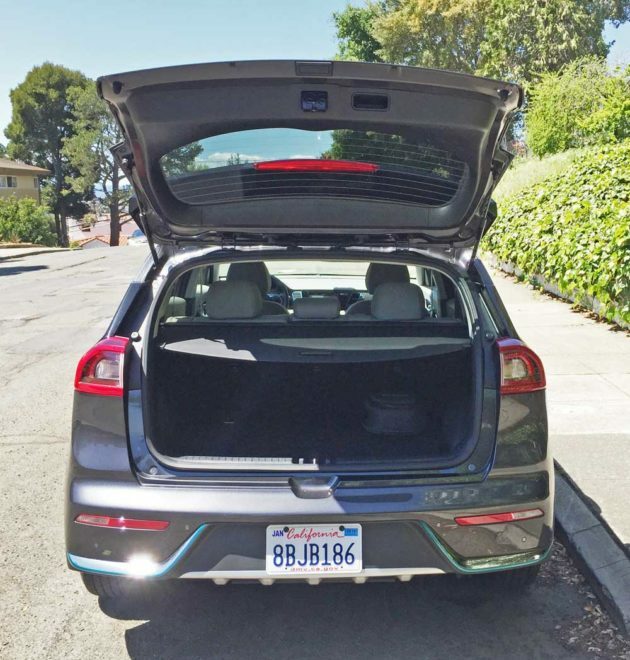 A world record mileage drive from coast to coast from Los Angeles to New York in a hybrid car was done in a 2017 Kia Niro averaging 76.551 mpg (3.06 liters per 100 kilometers). 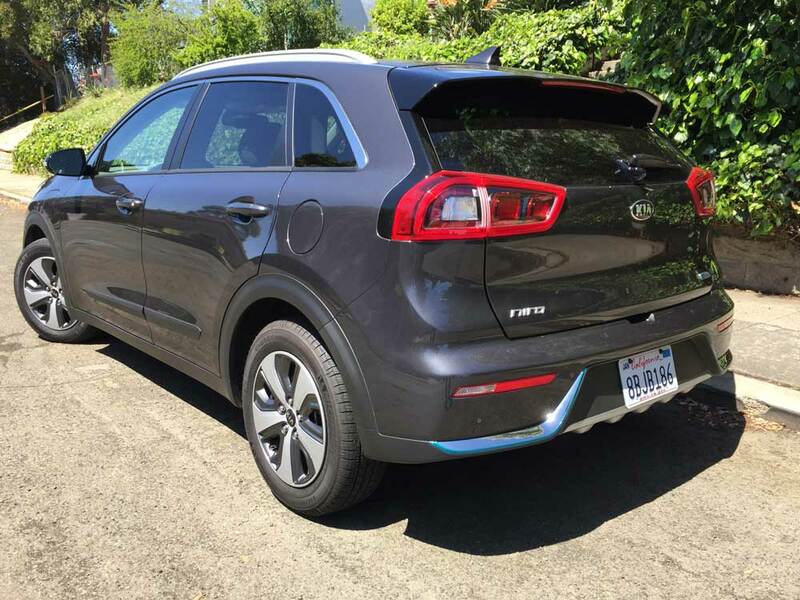 In the final analysis, the 2018 Kia Niro PHEV EX Premium is an eye-pleasing, compact, wagon-like, urban hybrid crossover that is not only affordable, but also versatile and practical, it is also one of the most efficient hybrids available in today?s marketplace. Engine Type and Size: 1.6-liter DOHC, 16-valve Inline 4-cylinder Gasoline Direct Injection. Electric Motor: 240 Volt AC Synchronous Permanent Magnet Motor, 240V / 43 Horsepower /125 pound feet of torque. Combined System performance combined power? Transmission: Six-speed Dual Clutch Transmission with standard Sport Mode and dry, multi-plate hydraulically actuated. Drive Train: Transversely-mounted front engine / Front-wheel Drive. Suspension: Front – Independent MacPherson struts, with gas twin tube shocks and stabilizer bar. Rear ? Independent Multi-link with gas twin-tube shocks. 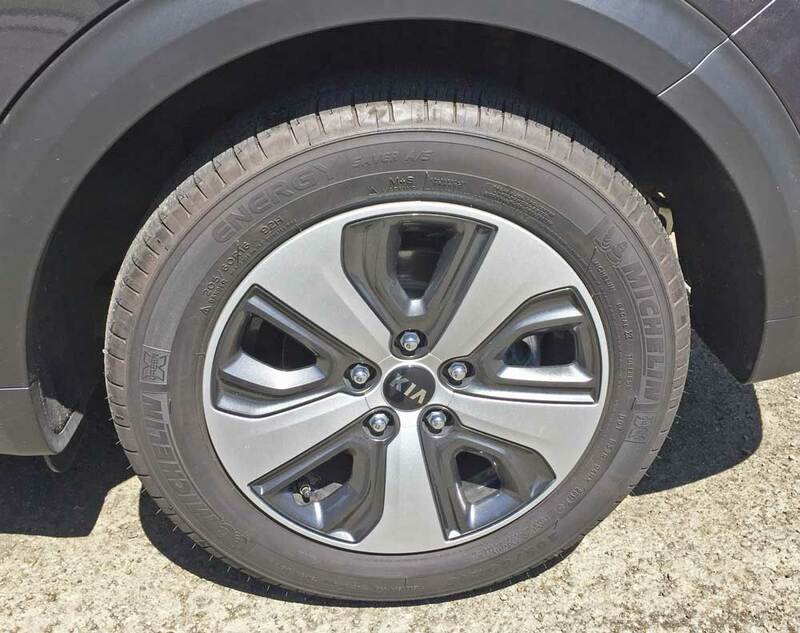 Tires: Michelin Energy Saver A/S 205/60 R18 91Y mounted on 5- spoke machine face alloy wheels, with painted inners and spare tire mobility kit. Height: 60.8 inches w/ roof rails.